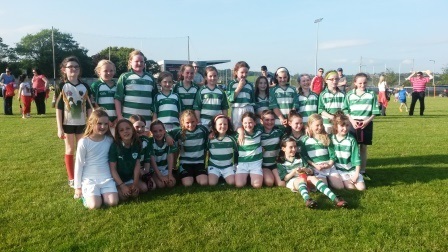 U10: Cora Higgans, Gemma Murphy, Caoimhe Hurley, Maebh OâSullivan, Lucy Calnan, Ciara Taheny, Sarah Kenny, Aoife Dineen, Siofra Kelleher Barry, Emma OâSullivan, Ellen Murphy, Orla Hales, Oonagh Hayes & Sinead McCarthy. Played on Sunday morning March 23rd in Ballinspittle,the Valleys girls started well scoring a goal against the run of play by Eimear Whelehan, which was very well worked up the pitch with Roisin O'Donovan linking with Danielle Murphy and onto Jennifer O'Donovan before Eimear struck to the back of the net. This seemed to wake Courceys and almost immediately they went down the pitch and equalised. Playing against the wind and up the slight hill Valleys were under pressure for most of the first half and only for solid defending by Eva Murphy, Carol Cremin and Davena Sheehan, Valleys could have been further behind at half time. Courceys scored a further goal and a point to lead 2-1 to 1-0, but just before the half time whistle a well worked goal which started with Isobel Lordan ended with Grainne Dart O Flynn hitting the back of the net in what was the score of the day. After the restart Valleys put severe pressure on the Courceys goal but were unable to penetrate the Courceys defense. Eventually, Danielle Murphy pointed to draw the sides level for the first time. With good play from Roisin O'Sullivan, Nicola Callanan, Kate O'Halloran, ellen Fennelly and Olivia Hayes we were unable to breach their defense again apart from a pointed free from Danielle Murphy. Courceys went on to score 2 more late goals and a point to win the encounter 4-2 to 2-2. This was a great display for the girls first outing of the year. Team: Nadia Satini, Emma Murphy, Eva Murphy, Davena Sheehan, Carol Cremin, Roisin O'Donovan, Adi O'Sullivan, Grainne Dart O Flynn, Isobel Lordan, Kate Murphy, Danielle Murphy, Aoife O'Brien, Roisin O'Sullivan, Jennifer O'Donovan, Eimear Whelehan: Subs: Kate O'Halloran, Clodagh O'Donovan, Sarah Lynch, Ellen Fennelly, Olivia Hayes, Nicola Callanan, Niamh Hurley.